My fond towards tram was started quite sometimes ago. 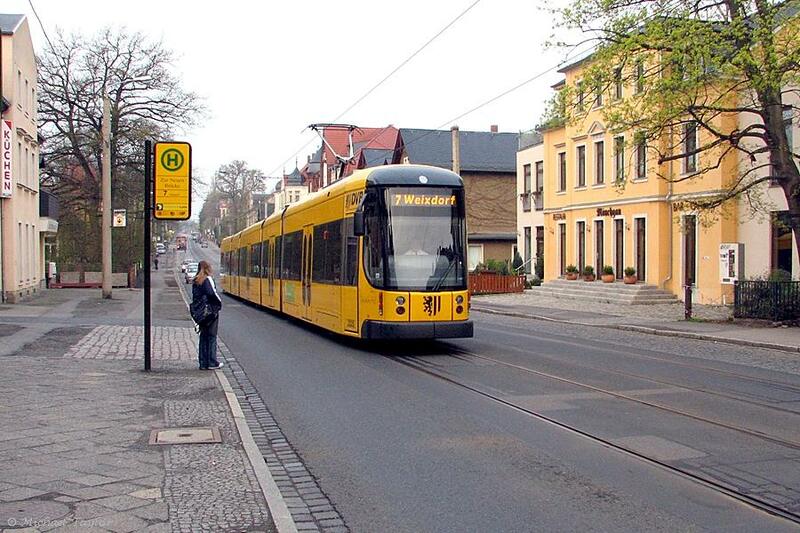 It was during my first encounter to the Western urban setting in Germany, had I tried my first tram ride. And it was just like a love at the first sight. The first tram experience for me was back in 2006. It took me from a central rail station at Dresden (Dresden Hauptbanhof) to the Zwinger palace. It was a short trip, maybe less than 15 minutes, however the memory lasts way more than that. It was a kind of combination between walking, since we were moving very near to the pedestrian level, with using a city bus. The ride was very smooth and quite fast. And along the way, I enjoyed very much the city scenery from inside the tram. Glances of notorious baroque buildings, European-style classical landscape and landmarks, and repetitive grids of urban blocks had guided me to instantly digest that tram was a part of the Western world. This misleading judgment stayed in my perception for quite some time. However after many years absorbing knowledge and facts on urban development, I have come to a conclusion that it was not entirely true. The tram was indeed firstly introduced in Wales, a part of Great Britain, yet during its long and difficult journey of development it has spread to many parts of the world, the West and the East, the North and the South. It is a long journey since tram was actually appeared the first time in the beginning of the 19th century. It has amazingly survived more than 2 centuries since then. And it is also a difficult journey since the rapid invention and technology advancement of private motorized vehicles had pushed the tram out of the competition in many countries. Yet the facts show that tram is coming back stronger than ever in recent days. How is it possible? Let me try to elaborate here. To some of you who might be not yet familiar with tram, it is actually a shared or public vehicle that is based on rail or track way. The difference with train is that tram usually operates within the urban setting on the same platform with the roads for private motorized vehicles and just next to the pedestrian ways and cycle tracks. In some special yet rare cases tram also uses its own segregated tracks. The main benefit of being with the same platform with other common modes of transportation is that people could access tram with ease without having the necessity to enter certain building, rush into certain gate, and climb up to different platform as if we would use the train. The other benefit of sharing the existing platform is that the cost of investment to build the infrastructure and to compensate for the designated land would be much cheaper compared to the investment to build normal railway. In order to access tram, people only need to find its tram stops, just like bus stops for public bus. After reaching the stop at the other end of the journey, we might not need to go far away to reach our destinations as well. Therefore its close and direct accessibility within our neighbourhoods is its main feature to attract its users. According to International Association of Public Transport (UITP) up to now there are already tram services in 388 cities around the globe including the modern innovation of it which is more popular under the name of Light Rail Transit (LRT). It covers 3% of the total journeys made by the world citizen (UITP, 2015). There is still not much portion of the cake if compared to the use of private cars for example. However more and more people has realized that tram offers a potential solution for the global carbon emission resulting from the current condition of urban transportation. How is that possible? Similar with bus, tram could transport more people with less road space. Transportation Research Board mentioned in their report that 1 tram unit could replace 40 cars in average (Transportation Research Board, 2001). This comparison showed that tram would generate less carbon emission than private motorized vehicles. Also with having in mind that, it operates mainly by using electric power supply. These are already very important advantages of tram as one of the low carbon urban transportation modes. Therefore nowadays, tram is gaining back its popularity. Being considered in the same group with bus, metro, and other kind urban public transports, it becomes a strong competitor for personal cars more than ever. 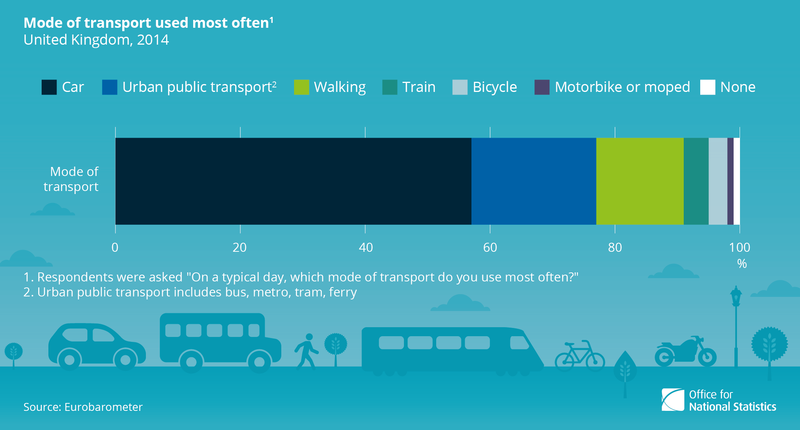 In the United Kingdom, it is the 2nd most used transport mode in the urban setting (Eurobarometer, 2014). 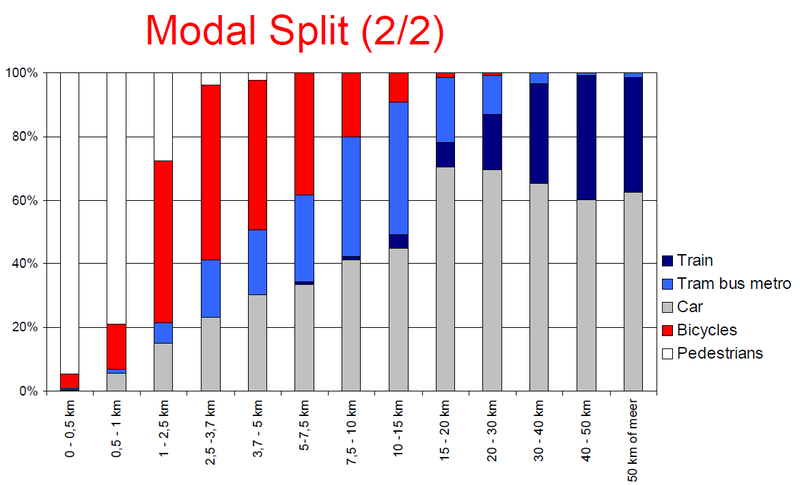 Especially for the middle distance of travel (7.5 – 10 km), the citizen of Amsterdam use tram at the similar percentage as they use car (Meijer, 2012). This popularity does not only apply in European cities but also in American (northern and southern part), Asian, and also Australian. I had experienced tram riding in Hiroshima and Kumamoto, two major cities in the central and southern Japan. Surprisingly it brought the similar feeling from my first tram ride a decade ago at the other part of the world. Once the ride begun, I immediately merged into the urban structure as if I was a part of it. And for some reason, tram does attract more attention of people whether due to its physical appearance or due to the sceneries when people travel in it. So this is another extra value of tram. It could be a subject or object of tourism as a part of city’s history or unique innovation. As an example of it, I am proudly presenting to you a case from my homeland, Indonesia. In the city of Solo, one of the major city in central Java, the tram, locally referred as a railbus, runs through the city by crossing major junctions and sliding along the main roads of Solo, transferring people from Purwosari to Wonogiri (Solopos, 2012). Instead to be used as a public transport, due to massive use and demand of motorcycle in the city, it is more utilized as a major attraction for tourism. Many families would take the trip with Batara Kresna, the name of the tram taken from local folk culture, during their weekends and enjoy the ride going through the city and also the countryside (www.kaorinusantara.or.id, 2015). Even more encouraging to know that Batara Kresna is a tram made by PT INKA which is a national company of Indonesia and it is not the first tram that they made. The first tram is Railbus Kertalaya in South Sumatra Province which was introduced in the year 2009 (Kompas, 2009). As a closing for my article, I would like to dream that one day I would take another memorable ride with the tram. Only this time it will not be neither in Dresden nor in Hiroshima. But it would be in my hometown, Metro, a small town in the Lampung Province of Indonesia. It has all the urban characteristic to utilize tram such as the physical or geographical attribute which is relatively flat area, an urban structure with grid system, and a vision for tourism. I have once written a kind of fictional story about Metro which included the introduction of tram in Metro. I would end this article by quoting some part of that story titled “Masa Depan Kota Kita (The Future of Our City)”. Sorry it is in Indonesian language. “Eh, apa itu ya di depan sana?”, suara berat Prof. Eko terdengar sambil menunjuk ke arah tengah kota. Dari arah yang sama segera terdengar bunyi yang cukup keras yang menyerupai klakson kereta api dan menyusul kemudian dua rangkaian gerbong mendekat. Tapi gerbong-gerbong ini bukanlah gerbong kereta api, melainkan gerbong trem! Di bagian depan trem tersebut ada tulisan METRO URBAN LINE. Di bawah tulisan itu ada tulisan lain yang lebih kecil berbunyi SUDIRMAN Rd. – AH NASUTION Rd. Terlihat banyak sekali penumpang yang turun. Mungkin karena ini adalah jam pulang kerja. “Ah, seperti model trem di kota Hiroshima sepuluh tahun yang lalu. Mungkin ini dapat lungsuran dari sana. Tapi masih bagus banget kelihatannya. Ayo segera kita naik!”, ajak Prof. Eko kepada anggota rombongan yang lain sambil bergegas naik ke gerbong paling belakang. Tak lama kemudian trem itu bergerak ke arah yang berlawanan yaitu kembali menuju ke arah tengah kota. Bagian dalam gerbong tersebut masih terlihat baru dan bersih. Di bagian tempat duduknya dihiasi motif ornamen yang sama seperti yang tercetak di dinding gerbang utama Kota Metro. Tempat duduknya terletak memanjang di kedua sisi dan saling berhadapan sementara area di bagian tengah adalah area bagi penumpang yang berdiri. “Oh, yang tadi itu adalah halte trem. Baru kelihatan tulisannya sekarang.”, sambung Prof. Eko lagi sambil menunjuk ke arah bangunan yang mereka tinggalkan. Dari arah belakang mereka terbaca tulisan yang berada di atap halte itu yang bunyinya METRO URBAN LINE – SUDIRMAN STATION. 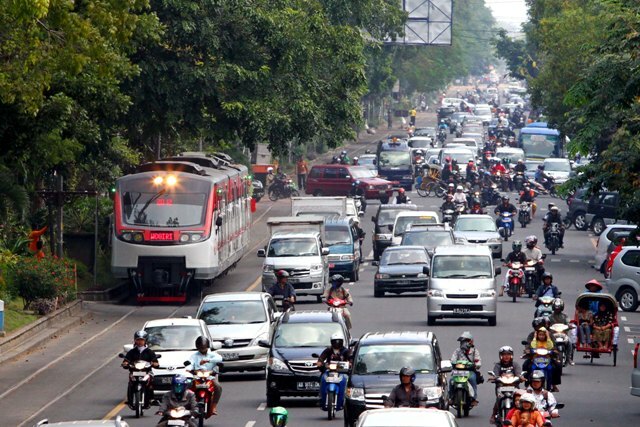 Trem itu melaju perlahan membelah Jalan Jenderal Sudirman yang saat ini kondisinya sudah berubah total. Ruas jalan kendaraan bermotor yang sebelumnya ada dua jalur pada dua sisi saat ini hanya tersisa satu jalur saja di masing-masing sisi jalan. Ruas jalan ini diapit oleh area hijau yang cukup lebar dengan pepohonan peneduh yang sangat rimbun. Area hijau ini membatasi antara jalan kendaraan bermotor dan area pejalan kaki yang saat ini menjadi sangat luas karena membentang sampai persis ke batas bangunan. Tidak ada lagi terlihat parkir kendaraan bermotor di depannya. Bangunan-bangunan yang ada di sepanjang jalan ini adalah bangunan-bangunan dengan fungsi komersil dan bisnis seperti toko, restoran, bank, kantor, dan sebagainya. Jumlah lantai bangunan-bangunan tersebut tidak ada yang melebihi dari empat lantai sehingga kawasan itu walaupun sangat padat tetapi tetap terlihat lapang. Papan nama bangunan-bangunan tersebut pun walaupun beraneka ragam bentuknya akan tetapi mempunyai keseragaman letak dan ukurannya. Saat ini kawasan tersebut terlihat mulai ramai oleh pengunjung. “Teman-teman, mari kita turun di pemberhentian terdekat. Ingin sekali saya merasakan berjalan kaki di tempat seperti ini. Badan jadi sehat, sekalian cuci mata…haha…”, terdengar gelak tawa dari Chandra yang sepertinya sangat menyukai suasana keramaian seperti di luar tram. Yang lain pun tidak ada yang menolak. Trem tersebut berhenti di halte berikutnya yang terletak di depan kompleks pertokoan yang dulu dikenal dengan nama-nama SHOPPING dan METRO MEGA MALL. Di Halte itu tertulis nama METRO URBAN LINE – SUMUR BANDUNG STATION. Bergegas semua anggota rombongan itu turun dari trem dan mulai berjalan menyusuri kawasan tersebut. Di area pejalan kaki itu terlihat pula jalur sepeda seperti di trotoar sebelumnya. Namun yang istimewa, trotoar ini dilengkapi juga guiding block yang berwarna kuning dengan pola tegel khusus yang diperuntukkan bagi para penyandang tuna netra. Rombongan itu tampak sangat menikmati suasana kawasan tersebut. Semburat sinar senja menyeruak dari atas pepohonan menimbulkan efek bayangan yang dramatis di trotoar dan dinding bangunan-bangunan di sekitarnya.